This lighter little brother of the SJ-1000 weights in at 14 oz and is outfitted with 3 razor sharp hooks, a 7.5” glow-in-the-dark body, and a luminous lead weight on the bottom of the jig. This Giant Squid Jig will slay even the most monstrous of squid. Pack one in your tackle box in case you encounter any monsters. 5 hook gangion designed with the right mix of flash and glow beads to draw squid to strike. Outfitted with more and stronger high quality razor sharp hooks handtied to heavy-duty 100 lb leader material and swivels. Izorline, who makes and distributes a variety of squid jigs, has just introduced a new "Lighted Squid Jig". A Cyalume light stick fits inside the newly designed squid jig. The light sticks stay illuminated up to 4 hours or more and can easily be replaced. 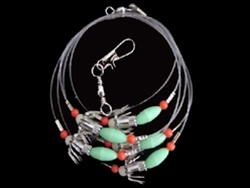 "These new lighted squid jigs catch and attract squid like crazy"!